Goldlocks’ misunderstanding with the three bears and Little Red Riding Hood being eaten by the “Big Bad Wolf” is a key part of many childrens’ upbringing. But the negative portrayal of apex carnivores in literature is, arguably, one of the most ecologically damaging messages we could be telling our children. One of the most widespread changes which has occurred over the last 100 years is the trophic downgrading of the natural world. Whilst this may seem technical, what it actually means is the systematic removal of apex predators from the natural world. Across the world apex carnivores are in decline both geographically and numerically, with urbanisation and farming driving a consistent increase in human-wildlife conflict. Going back to Red Riding Hood, the last wolf in England was officially killed in 1390 and the last wolf in the UK was killed in Killiecrankie in 1680 by Sir Ewen Cameron. Whilst at first glance this may seem a positive with fewer livestock deaths being caused, the havoc this has played within natural populations, especially of deer, has been extreme. Across the world there are explosions in populations of deer, be they Red deer in Europe, Sika deer Asia and both white-tailed deer and elk in America which damage crops and stop the regeneration of forests. The best way to examine the effects of changes in wolf populations is through what is termed a natural experiment, a biologists term for removing a species, leaving everything for a bit and then reintroducing them. What happens over this period can then be attributed to different causes, be they climatic, anthropomorphic or due to your species of interest. This sounds difficult to plan out, but, fortunately, the hunting of wolves in the early 20th century did such eradications in the national parks of America. Scientists looking for a solution to the deer damage completed the natural experiment by reintroducing Grey Wolves from Canada into the Yellowstone National Park in 1995, 70 years after they were eradicated. So what was found out from this experiment? The greatest change is the decrease in the red deer population. Over the first 15 years the population decreased by three quarters from 20 thousand to just 5 thousand, where it has remained consistently since. This dramatic change in population size was due to an increase in predation by the 21 wolves introduced. The wolves, though few in number, were also sufficient to have a major effect on the behaviour of the deer. They stayed away from places they could be captured most easily, the rivers and the valleys, and this led to the coining of a new term, the landscape of fear. In these areas the regeneration of aspen and willow forests restarted, and the number of beaver dams increased from 1 to 12. Bears also came to feed on the carcasses of wolf kills, and their subsequent increase in population reinforced the effect of the wolves by pushing the deer into areas where the bears could kill the fawns. Anecdotally there is an increase in songbirds and migratory birds in these forests, however this remains to be proven via population studies. In short, the reintroduction of wolves has catalysed a shift towards a more healthy ecosystem, with the start of a transformation of the landscape from degraded grassland with low biodiversity to a vibrant and species rich forest of aspen, willow and cottonwood. So what can we learn from this story? This experiment has, amongst others, demonstrated the interconnected nature of ecosystems and shown that population sizes are regulated by predation pressure. In the process it has added complexity to the traditional view that ecosystems are only regulated unidirectionally from the bottom up (vegetation to herbivores and herbivores on to carnivores). We can also learn that landscapes are more biodiverse and populations are more stable in their natural context. It has also been found that it is much cheaper and more effective to let wolves control the population numbers than to have periodic culls. The monetary value of the wolves also lies in providing a serious increase in tourism revenue for the local area – at one point valued at $3 million a wolf. 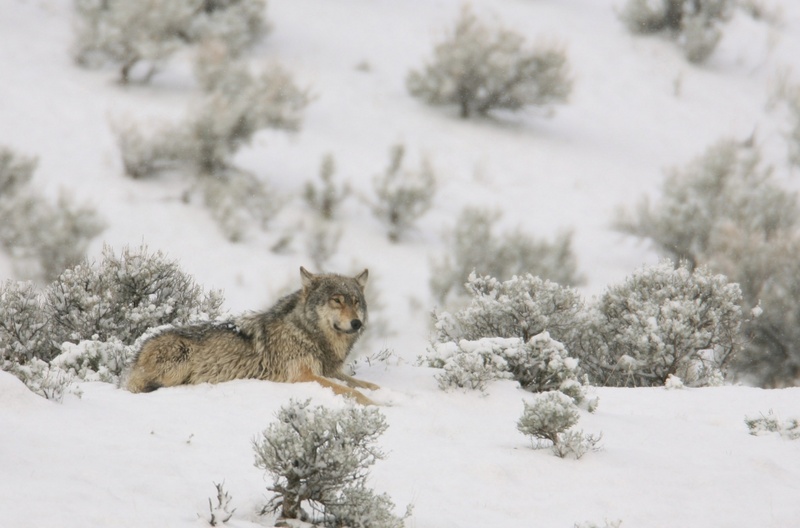 Within the deer populations there is less disease prevalence, as it is the elderly and the weak which are targets for the 11 wolf packs which now call Yellowstone their home. Wolves also supress the populations of other lesser carnivores, called mesopredators (which eat herbivores but are eaten by apex predators). These mesopredators, like raccoons and coyotes, often are themselves pests and so the wolves are, by supressing their number, reducing pest outbreaks. It can therefore be seen that, contrary to Little Red Riding Hood’s narrative, wolves have an overall positive impact on their environment. The role they perform is not dissimilar, ecologically, from that of lions in Africa, tigers in India or killer whales along the coastal waters of the Antarctic. The apex carnivores of the world are essential for maintaining the function of our ecosystem which, when healthy, will help us provide clean water to our cities, increased pollination for our crops and potentially, as forests regrow and capture carbon, slow down climate change and help us to save our planet. Shaken, not stirred: does tasty Vodka actually exist?